As originally seen on the Channel 7 Today Tonight TV Show, our paw paw products, including our natural paw paw soap, skincare creams and paw paw based therapeutic products have been showcased several times in recent years highlighting the skincare benefits of pawpaw. McArthur Skincare – originally McArthur Natural Products, is a great Aussie story of a company that grew from a backyard operation, where raw paw paw was mixed in the kitchen through an intensive testing process to create the ultimate secret ingredient of the highest concentration of paw paw extract in a cream which we still use today in our range of sixteen skin and hair products. There is paw paw galore in our manufacturing process, where we have refined paw paw liquid gold! Ours is a new take on an old favourite, using paw paw which has traditionally used by local villagers in the remote rainforests of Borneo where our co-founder Tom McArthur first observed the use of Carica Papaya (Papaw). Paw paw is great natural ingredient for use in skincare products that do so much, from helping cleanse pimples, soothe nappy rash for babies to moisturising dry skin. 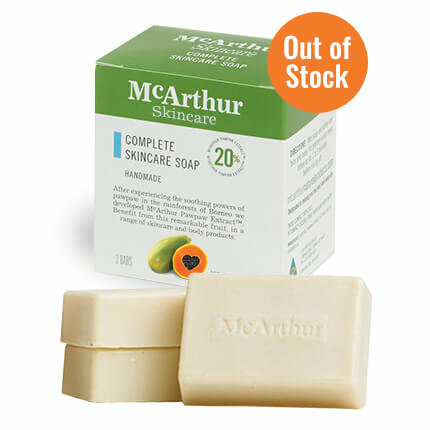 McArthur Skincare’s Complete Skincare Soap is a gentle and effective cleanser that’s hand made in a careful process in our factory in Queensland. Handmade in a slow process that retains the effectiveness of its natural ingredients, our Complete Skincare Soap has a uniquely silky texture and contains no sodium lauryl sulphate, parabens or propylene glycol. McArthur Skincare’s Complete Skincare Soap is handmade in our factory in Queensland, Australia. Initially the soap goes through a special saponification process that enables us to incorporate 20% of our unique McArthur Pawpaw Extract™ and lavender oil into the soap blend, adding specific proportions of olive oil, vegetable oil and lye. Our Therapeutic range of products are listed on the Australian Register of Therapeutic Goods and each contain high concentrations of natural active ingredients traditionally used in herbal medicine including; Aloe Vera, Chickweed, Arnica and Chamomile. At McArthur Skincare, our entire team is dedicated to helping you feel and look your best.